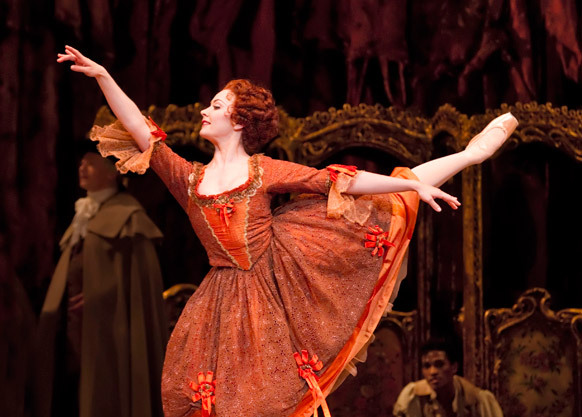 Reconstruction is the new black in London’s ballet summer season. The Mikhailovsky brought us earlier this week Mikhail Messerer‘s charming restoration of thirties success Laurencia (more on that later) and now the Bolshoi follows their opener Spartacus with something, in my opinion, far more interesting and entertaining: Sergei Vikharev’s reconstruction of the Petipa/Cecchetti original St. Petersburg staging of Coppélia. To understand what goes into reconstructing vintage ballets we recommend you read this excellent feature at The Arts Desk which includes an interview given by Vikharev to Ismene Brown. Amongst other topics Vikharev talks about how he came across Nikolas Sergeyev’s original notations of 24 ballets from the golden era of dance in Russia, what became of the productions he had previously staged for the Mariinsky (including the reconstructed Sleeping Beauty) and why certain productions might not be worth revisiting at all. 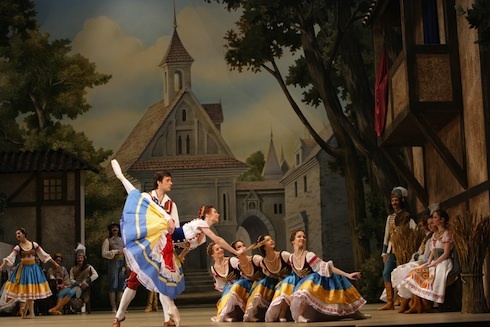 This Coppélia however proves the case for Vikharev’s approach. It is a jewel of a ballet with a sublime score by Delibes, presented in a staging that the Bolshoi should be proud of. Stylish, full of character, with exquisite costumes and settings. One hundred years later it still feels fresh, with plenty of details for us to feast our eyes on. Rather than looking quaint or cheap-faux period the stage décors are beautifully crafted. On one of the walls inside Dr. Coppelius’s house hangs an interesting painting which features a duel between the sun and the moon. It made me wish that we could see less stylised, more elegant ballet settings more frequently. But it is not only the lush staging that makes this production so endearing. The spunky Swanilda, her beloved Franz and the enigmatic Dr. Coppelius are brought to life by a superb cast. 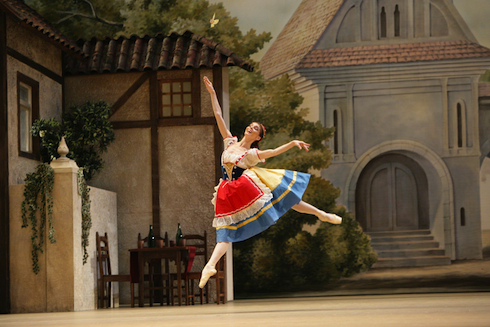 Natalia Osipova shines with her technique and perfect comic timing; feisty funny and utterly adorable in the mime scenes with Gennady Yanin’s Dr. Coppelius. Ruslan Skvortsov as her caddish lover Franz has an irresistible charm. True, the choreography does not give him much to do before the wedding pas de deux but he has plenty of stage presence to compensate for and ultimately we do get the sense that Swanilda, while resentful of Franz’s infatuation with the mechanical doll Coppélia, can’t help being “mad about the boy”. As averse as I am to divertissements I felt the energy in group dances such as the mazurka and czardas was contagious. They were performed and conducted with the sort of bravado the Bolshoi are well known for. And in the final act the dances of the hours which included beautiful solos for Ekaterina Krysanova (dawn) and Anna Leonova (folly) were pure balletic delight. I’d be interested in seeing how much the second act (in Coppelius’ workshop) resembles NYCB’s and ABT’s. Danilova staged it for Balanchine, and Freddie Franklin for ABT, so it’s not surprising that they’re nearly identical. I imagine it’s much as Danilova learned it back in Russian a century or so ago, not too long after this version. this is a really clever blog. to be honest the title is what caught my attention. it may just be me, but out of curiosity did you name it after the white stripes song?